Hello fellow stampers and knitters. Beth Norman here with a Christmas project to share with you. Haven't you been inspired with all the goodness of the 30 Days of Christmas so far? I hope I inspire you to create some much loved Christmas tags using #SD654 Merry Christmas. I just love this image because it allows for colouring--something I love to do. Throughout the year I knit large sized dishcloths and wrap them in ribbon individually, and in a group of four such as you see here. Something I did a little different this year was to add bells to the ribbon which you can see on the close-up. At last count I had 100 dishcloths made. All 16 of my coworkers and boss receive one of these for Christmas. 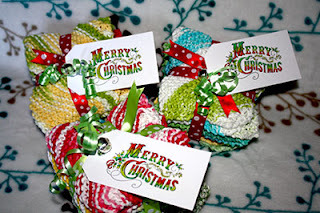 I like to give my dishcloths to friends, pharmacist, dentist, doctor, etc., and what better way to present them than with ribbon and a handmade tag. 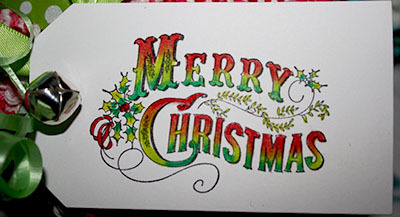 As you can see, I coloured the Merry Christmas in two tones with my Prismacolor pencil crayons and OMS. You can even see the bell that I added. I hope I inspired you.